Bamboozle -- my 10 pound trick dog, sat poised off camera, awaiting his signal. As I steadied my outstretched palm -- his signal to stay -- I waited for the director's cue. In sequence, the cameraman gave a thumbs up, the director pointed to me and me to Boozle. A blur of white arched onto the green screen and faced me, as I maneuvered below the camera's lens. As if by wizardry he stopped dead center and shook as if he'd just emerged from a swimming pool. It was a metal-worthy performance, captured in just under 3 seconds. Eyes bounce from one to another. It looked good. Was it good? I think it was good. It was really good. Typical verbiage on a commercial shoot or so I was told. Take Two! Thirteen retakes later, and the jury is still out as to whether they will use Boozle's enactment, or another slightly larger dog rendition. The bottom line? There's far more glamour in the pet entertainment industry, than money or fame. Our Brooklyn adventure involved a full day of shooting -- not to mention 3 hours travel time, and a film crew of 20+ to capture what amounted to 39 seconds of footage. Have I piqued your interest? Are you envisioning your dog's image blazoned across the big marquee? While most people's training goals begin and end with come, others strive for a more elaborate repertoire of learned behaviors. Many of these enthusiasts are clients. In my book Dog Tricks and Agility for Dummies, I outline over 100 tricks -- known in professional circles as behaviors, that can be easily taught once a dog has learned some basic skills, such as down, which can lead to rollover, crawl and play dead; holding skills can be expanded to carry, fetch and deliver; and jumping maneuvers, can be directed through a hoop or window frame, over a hurdle, or into someone's arms. Next time you're watching a dog on the big screen, look through the eyes of a trainer and trace their gaze. Is the dog focused on the action? Not really. He's clueless as to the story line. Is the dog trying to please the director? No, no. Could live without the director. How about the victim-anything going on there? Wrong again. It's unlikely that the dog has socialized with anyone on set. The dog is watching one person only, and that is his handler, who is strategically positioned out of the frame. For their part, dogs are probably the most welcome cast member on set, never demanding anything more than their fair share of kibbles and a comfy pillow at the end of the day. For his part, Boozle had to run to a target square (I used a business card-sized cut of green screen to condition him), angle 90 degrees to face the camera and offer a full body shake. In the editing room he'll be superimposed on a stack of towels. What is the goal of this accomplishment, which took 8 training days to perfect? To touch American hearts with his puppy dog enthusiasm and, ultimately to increase detergent sales. 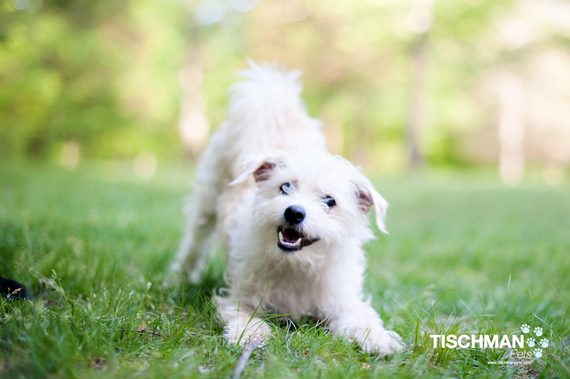 Think one of your pets might have what it takes to carve out an acting or modeling career? You'll need to attract an animal agent -- no one will hire you from a photo, even one that's professionally taken. Agencies carry insurance and their directors have an established relationship with ad agencies and producers. 1) Steady Around Distraction Cute and clever dogs are everywhere! People are right to think they would shine in front of a camera -- most do. But to be considered for stardom, any pet -be it a dog, a chicken or even a lizard, had to be steady around distractions. A lot of stuff happens on set that people don't think about. First there are lights. Big. Bright. Lights. Next there is the camera -- and we're not talking about an iPhone here. The cameras are large and mobile, often maneuvered during a shoot to capture at various angles. 2) Well Socialized Next there is the crew. Some still projects -- for a Kohl's catalog, for example, may have as few as 2 or 3 photographers assigned, while a Vogue shoot with Keira Knightley had a swarm of people. Before she signs a pet, Ms. Long conducts an interview, to not only meet a candidate, but to see how they will stand up to distractions. 3) Impulse Control Dogs should be steady with the 4 D's -- a term Ms. Long shared with the Today Show when she went on to talk about getting dogs into show business (this clip can be found on her website). Discipline Even modeling dogs must be trained to the basics and tolerate long periods of containment. All day shoots can offer a dog little stimulation; each dog must be well schooled. Distraction Commercial shoots and movie sets are full of commotion! Acting dogs must stay focused no matter what's going on around them. Distance While trick training is fanciful and fun, a dog needs to learn targeting. This involves going out, then stopping on a disc, eventually at a distance of 20 feet, to perform a specific behavior. Duration Two things can derail even a well-mannered dog, and that is duration and repetition. On set, a dog may have to hold a given position--say lying on a couch with its head between its paws, for up to an hour. Of course there are breaks, but they have to do it over and over and over until the director says we're done. This is why Border Collies make wonderful clients-they'll repeat a behavior all day if asked. Mildly compulsive, they never get tired or bored. Animal agents need all types of dogs in their roster. Rarely do they get to dictate what type of dog should be used. Ms. Long looks for fresh faces of all types--which can be quirky-looking mix breed dogs too (those are especially in these day) and for any type of pet who is steady and calm. Even rabbits, hamsters and lizards--as long as they've been socialized to all sounds and stimulations. Think your dog has what it takes? I know a good agent!